Learning and teaching at Charles Darwin University will be boosted today with the launch of a range of free mobile applications for staff and students. 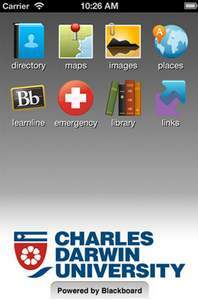 The CDU Mobile app will provide users with a range of interactive information including GPS-enabled campus maps, directory and library information. The technology will also extend access for CDU’s staff and students to the online learning environment (Learnline) on a wide range of mobile devices, from iPads and Android tablets to smartphones. Associate Professor Martin Carroll, Pro Vice-Chancellor Academic, said students would be able to access course content, contribute to discussion boards and blogs, contact their classmates and tutors, and review assignments, grades and feedback. Mr Carroll said that as mobile technology continued to grow across the globe, it was vital to make CDU’s services and information available through a mobile medium. “Our community is increasingly gadget-savvy and is looking for more and more of their CDU experience to be available any time, from any place, on any device,” he said. “Mobile Learnline allows students to carry on learning and be engaged with their course content and receive their grades and feedback away from the classroom,” he said.